With the arrival of the new V8, ‘5.0’ badges make a return to the Mustang’s flanks after an 18-year absence. Mustang GTs are also quickly identifiable by their grille-mounted fog lamps and 18-inch wheels that fit snugly under the boldly flared wheel arches. Make no mistake, the 2011 Mustang is no wallflower. From behind the wheel, it’s soon evident that the Mustang GT even with automatic transmission is not your grandmother’s Ford. When filled up with wallet-draining premium fuel, the 5L 4V Ti-VCT V8 kicks out 412hp and 390 pound-feet of torque. You’ll still see gas station owner’s smile when you drive in. OK so we know this is a driving machine. How does it stack up, overall? 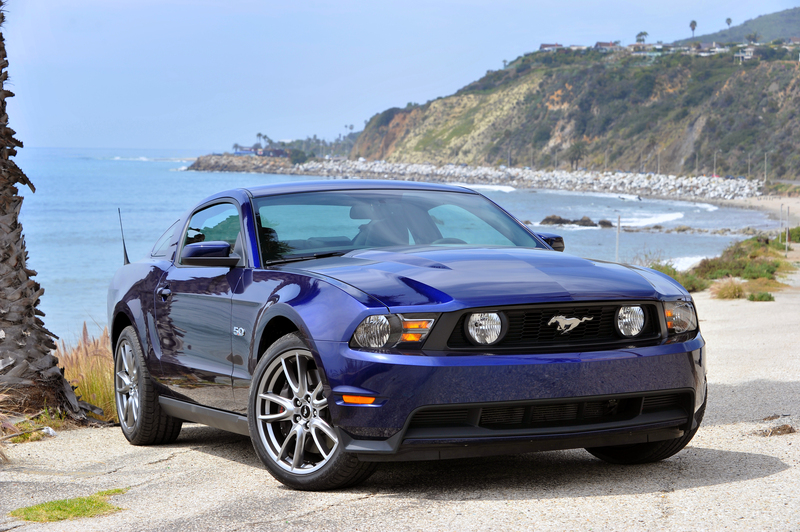 Chances are, you’re going to enjoy the time you spend inside the 2011 Mustang GT. Ford do not appear to have ‘cheaped’ out on materials and finish. The by now almost ubuitous (Microsoft) Sync infotainment system is pretty amazing, but it’s perhaps not quite as instinctive as TV spots might have you believe. Spend time with it and it is impressive and quite versatile. Word to the wise; the navigation system might even make getting lost fun. It’s one of the best out there – especially in this price range which, incidentally, starts around $40,000.